Creating a festive atmosphere in significant date? First and foremost, our inner sense of celebration. We send out invitations, prepare a menu for the gala dinner, an entertaining program for the guests and, of course, beautifully executed interior of our house. These preparations in advance sets us on the festive mood, creating a foretaste of the celebration and fun that is transmitted and guests when they come into our beautifully decorated home. 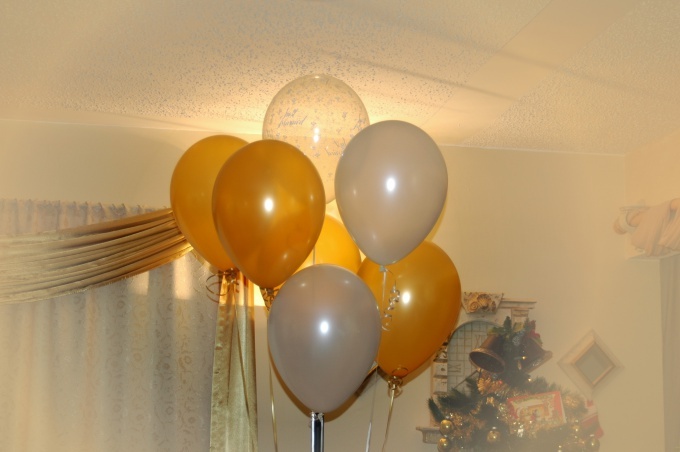 Easy, fast and inexpensive way to decorate your home for the holiday – to make it bright balloon compositions. manual mini pump and/or the balloon with helium. For the decoration of children's party colorful balloons – perfect. Decorate the room of a child with a garland of beads of small diameter. To chairs on which to sit young guests, tie colorful ribbons big balls (or bunches of small balls), inflated with helium. On one of the walls can be made from balloons giant number indicating the age of the little birthday boy. Will also be a Grand success large inflatable figures of favorite cartoon characters. An interesting element of festive decoration – garland-arch. To the line the required length and attach at equal distance from each other colored balls. The ends of the fishing line attach to the backs of chairs or on the ends of the sills so that the rising balls arced. Will look beautiful arch with attached balls to the ends of long curled ribbons. Under this scheme you can make a rainbow if you use several woods and balls of all colors of the rainbow. The plot of the garland with a length of 1.5-2 m long, crowned with the tip of one or more balls can be used as a decorative stand. Place several of these racks in the interior of the room, choosing colors and texture of the balls in accordance with the style and overall scheme of the room. Probably will look good stands, contrasting with the color of your room due to the special color or the shiny surface of the balls. Of the balls make the flowers and bouquets. To make the flower, inflate to 4 equal size balls of the same color. Tie them in pairs and loop these pairs among themselves, giving the shape of a flower. One of the balloons tie a small ball of contrasting color and place it in the center between the "petals". Attach to the wall or Cabinet several of these colors on double sided tape. To do "stand-up" flowers or bouquet, inflate the leaves and core colors with helium. Fold them in a flower, and long green beads for the simulation make the "stem" and "leaves". Attach the stem to the flower. Stylish and a bit weird looking flowers with spirally curved stems. From the bottom to the stem, tie a small sinker or a balloon filled with water – thus the flower can be "put" on the floor. Make a bouquet of several flowers and tie them with bright ribbon. For the decoration of the room on the wedding day or for Valentine's day well suited balls in the form of large and small hearts. The heart shape can be given and the string of small balls, placing it on the wall or transparent curtains. Releasing many helium balloons-hearts under ceiling or scattered by air inflated balloons on the floor, you'll have a pleasant and unexpected surprise for your loved one. If the room decoration , you can combine balls of different types: matte, glossy, foil, various colors, shapes and sizes. Of the balls you can do different characters, trees, pictures with captions and other design elements. To inflate the balloons with helium, you will need a balloon with this gas, which can be purchased or rented from specialized stores. To inflate balls 100 only 10-liter balloon with helium. To inflate the balloons with air it is better to buy a special handheld mini-pump.